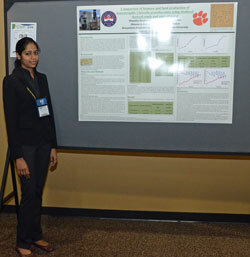 The conference features a first ever Next Generation Scientists for Biodiesel Poster Session this year. I stopped by to see what these student presenters were displaying. One of them is Shwetha Sivakaminathan, Clemson University. Her poster/project topic is “Comparison of biomass and lipid production of heterotropic Chlorella protothecoides using biodiesel derived crude and pure glycerol.” She speaks a language different than mine so I will let her explain her project in our interview. Shwetha is working on a Masters degree right now and contemplating a doctorate or perhaps entering industry depending on what opportunities she finds.